Colonel Karl E. Dankof (USAF-ret. ), a director of logistics for Shah Mohammed Reza Pahlavi’s Imperial Iranian Air Force (IIAF) from 1973-1978 as an employee of the Lockheed Corporation, has died in San Antonio, Texas on Wednesday, May 20th, 2009. He was 89 years old. The cause was kidney failure. Colonel Dankof was born on March 3, 1920, in Hamburg, Iowa, one of six sons born to a struggling German-American farming family which endured the hardships of the American Depression throughout the 1930s. He would prove to be the only child in the family who would graduate from high school because of the severity of the times. After graduation from Hamburg High School in 1938, he accepted a football scholarship from the University of Omaha in Nebraska. In June of 1941 he was offered a tryout with the Philadelphia Eagles of the National Football League (NFL), but elected to defer this opportunity until his scheduled graduation from college in 1942. He would marry his high school sweetheart, Vera, in June of 1941, a marriage of 68 years duration. Graduation from Officers’ Candidate School occurred in January of 1944, where he remained for a short time as a tactical officer and supply instructor. He was then transferred to the Miami Air Depot where he was assigned to the Supply Division. In 1946, Colonel Dankof was reassigned to the Erding Air Depot outside Munich, Germany, where in 1947 and 1948, he served both as Head Coach and starting offensive and defensive end for the Erding Arrowhead football team. In a fund-raising game for the post-Hitler German Youth Corps, the Arrowheads played to a capacity crowd in Munich of 65,000 people, in what was believed to be a then record for attendance at an American football game on German soil. 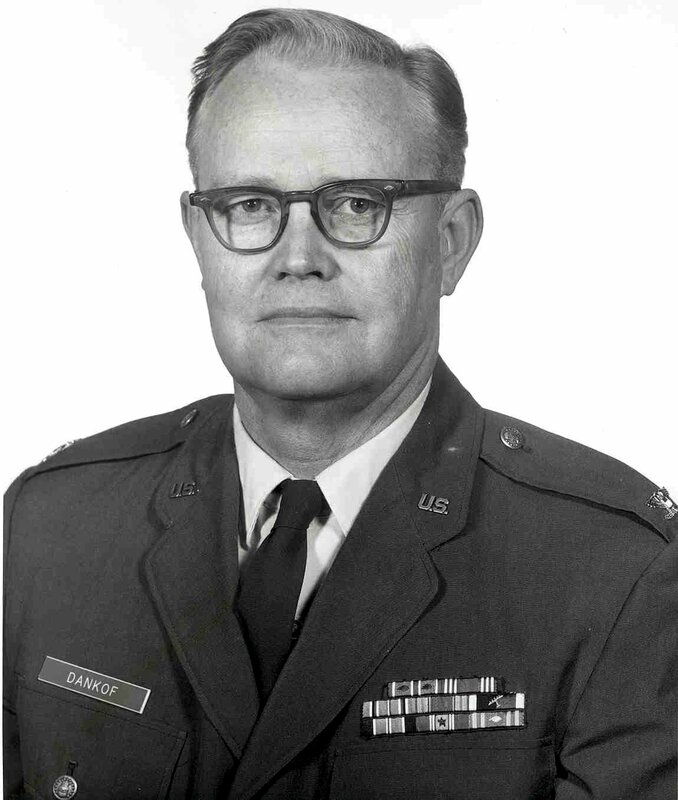 In 1950, Colonel Dankof was transferred to the Air Proving Ground Command; in 1953, to the Mission for Aid to Turkey in Ankara; in 1955 to the Air Force Advanced Management Course at Indiana University, where he earned a Masters Degree in Military Science and Business Administration; in 1956 to Headquarters, United States Air Force in Washington, D. C., followed by assignment in 1960 to the 1155th Technical Operations Squadron at McClellan Air Force Base in Sacramento for 3 years. During the Sacramento years, Colonel Dankof founded the Center Joint Little League in North Highlands, California in 1960-1961. As the League’s founder and first president, his efforts included the recruitment and supervision of volunteer work crews, and the contribution of his own physical labor, in the building of the baseball parks, backstops, and dugouts which remain in use to this day. In 1963, Colonel Dankof was assigned for a year to the Air War College at Maxwell Air Force Base in Montgomery, Alabama, graduating in 1964. His thesis pertained to the Alliance for Progress program for Latin America. From 1964-1967, he was stationed at Wheeler Air Force Base, Hawaii, with the 1156th Technical Operations Squadron. From 1967-1971, he served at Wright Patterson Air Force Base in Dayton, Ohio, followed by a stint from August 1971 to April of 1973 as the Air Force Logistics Command’s (AFLC) Liaison to Southeast Asia, in logistical support of the American air war over North Vietnam. Most of Colonel Dankof’s Air Force career involved two commands, the Air Force Logistics Command (AFLC); and the Air Force Technical Applications Center (AFTAC), which utilized the U-2 spyplane at the height of the Cold War to assist the Central Intelligence Agency (CIA) and the Atomic Energy Commission (AEC) in monitoring the missile sites and nuclear tests of the former Soviet Union. He was once chosen as the personal aide to General Curtis E. LeMay, founder of the Strategic Air Command (SAC), and Chief of Staff of the Air Force under President John F. Kennedy, for a command staff conference. After retirement from the United States Air Force in April of 1973, work began with the Lockheed Corporation as a logistical director for Shah Mohammed Reza Pahlavi’s Imperial Iranian Air Force (IIAF), based at Ghasre Firouzeh Air Depot with secondary responsibilities at Doshentappeh Air Depot. After the Islamic Revolution in Iran, Colonel Dankof spent several years with the Lockheed Corporation in Marietta, Georgia, and then 4 final years with the aerospace giant in Riyadh, Saudi Arabia, as a logistical advisor to the Royal Saudi Air Force. Prior to the health decline of more recent times, the Colonel spent his final years as a volunteer for the Randolph Air Force Base pharmacy, and a volunteer driver of cancer patients in San Antonio to chemotherapy treatments, where illness and lack of funds deprived the latter of private transportation to and from home. Membership was maintained in American Legion Post 612, Windcrest, Texas. Colonel Karl E. Dankof is survived by his wife of 68 years, Vera, an artist in San Antonio, Texas; two sons, Steven, an attorney in Dayton, Ohio, and Mark, a Lutheran clergyman at Immanuel Lutheran Church in San Antonio and radio broadcaster for the Republic Broadcasting Network; two daughters-in-law, Nancy and Carmen; four grandchildren, Elizabeth and spouse Virgil Welch, Steven Jr. and new bride Danielle Rachel Baron, Sarah, and Ann; one great-grandchild, Henry Welch; and many nieces and nephews in the Dankof clan in the Midwest, along with one sister-in-law, Ruth Dankof of Hamburg, Iowa. This latter group will be specially represented at Colonel Dankof’s services in Texas by Mr. Lowell Dankof of Omaha, Nebraska. Full military honors are scheduled at Randolph Air Force Base in San Antonio, Texas, immediately following a memorial service at Randolph Air Force Base Chapel One on June 5th, 2009; final interment is scheduled thereafter at Arlington National Cemetery in the Nation’s Capitol. Memorials in the name of Colonel Karl E. Dankof may be sent to the General and Mrs. Curtis E. LeMay Foundation, established to assist needy widows of both officers and enlisted personnel in the United States Air Force; the Lutheran Heritage Foundation, a translation ministry designed to spread the Christian Gospel around the world through translation of the Bible and Martin Luther’s works into a multitude of different languages; the special charitable funds of the National Kidney Foundation; or the ministry of Odyssey House hospice home in San Antonio, Texas at 4440 S Piedras Drive, Suite 125, San Antonio, Texas 78228.